Fits perfectly on your kitchen counter top. Gorgeous Rose Gold SS pail. Add 500 Red Composting Worms? Let the worms do the work for you! Add them to a worm bin and they will happily compost all the food waste you create! Use the pail for easy and mess free storage of food scraps until you are ready to toss in the composter! 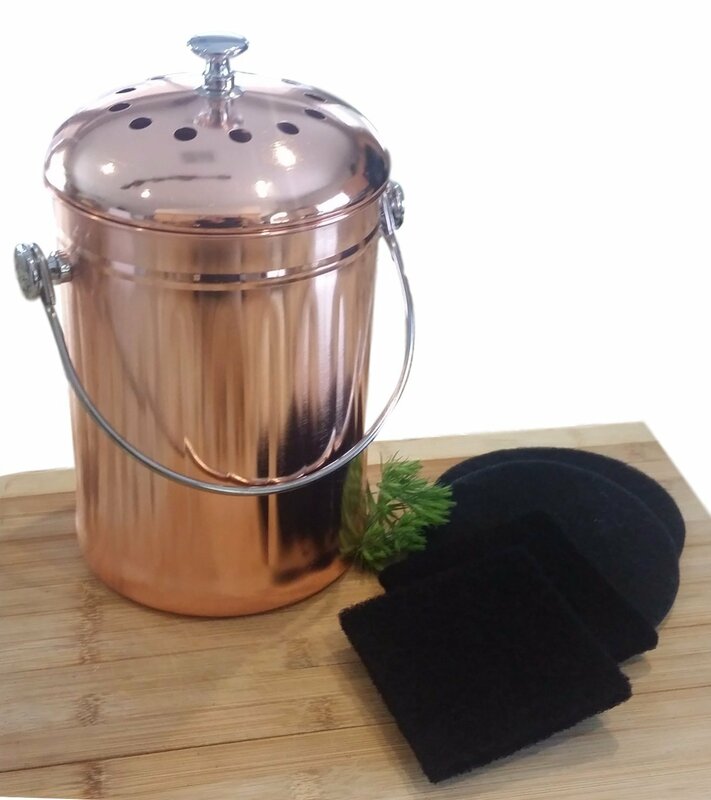 Who would think you could accessorize your worm composting with something so lovely? Tired of using something ugly and gross to store your food waste in before taking it out to the worm bin? Look no further! We got you covered! 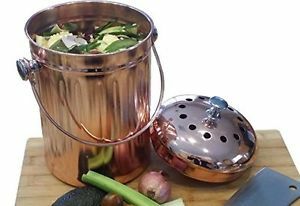 BEAUTIFUL copper coated stainless steel compost pail! 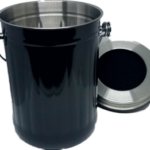 STAINLESS STEEL INTERIOR – Solid, no seam construction makes for easy rinse out cleaning. 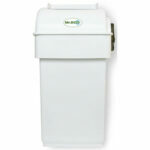 Won’t leach chemicals in to your compost and no liner required. 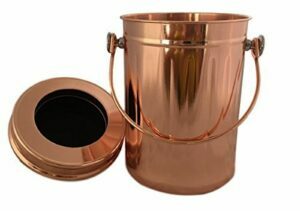 DECORATIVE COPPER – No need to hide under your sink! 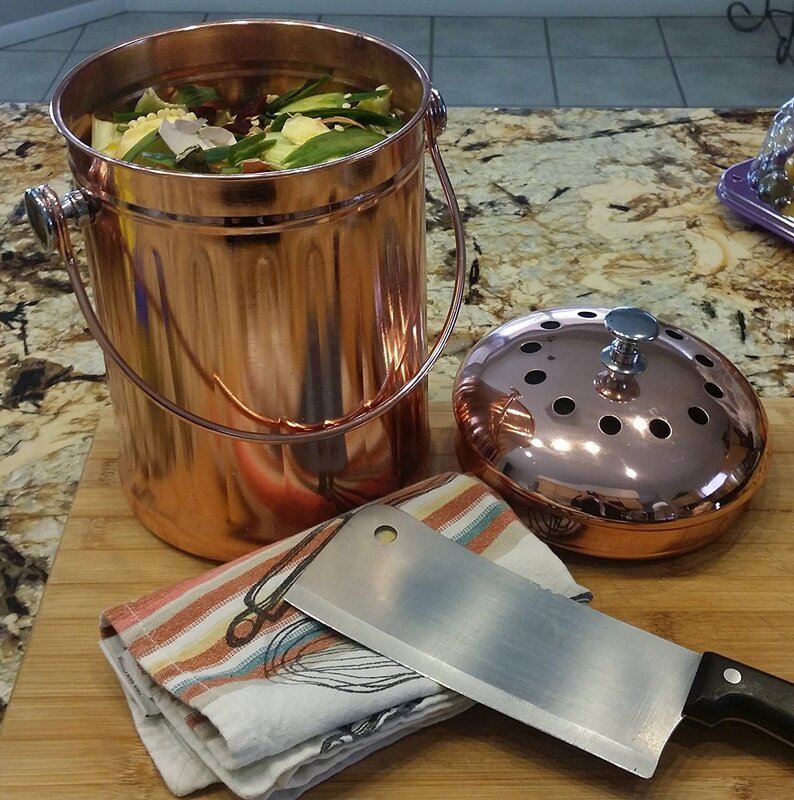 Proudly display as a matching copper kitchen accessories and decor. 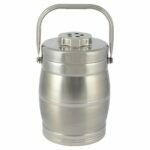 No more rummaging around under the sink for the old coffee can. 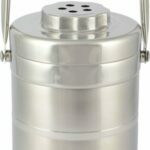 ODOR FREE DUAL CHARCOAL FILTER– Dual charcoal filter locks food scrap odors in. BONUS TIP – If you are in an area with fruit flies – put a drop of lavender essential oil on the filter as a natural repellent. I enjoy this fondly! Looks nice in the kitchen while holding all of the dirties! You don’t smell a single thing, even when the items inside are molding! will use this summer little flies not o problem this time of year. we use larger can in winter so we don't have to empty so often. Nice pail! Sturdy and pretty! Replaced my old stainless pail that had a loose filter top. This one is heavy and looks great. Filter top is very secure. Our new rose gold (copper toned) compost bin is a beauty in both form and function. It shipped super fast, and the total price was cheaper than the basic style sold at Target! Thank you Uncle Jim's Worm Farm!